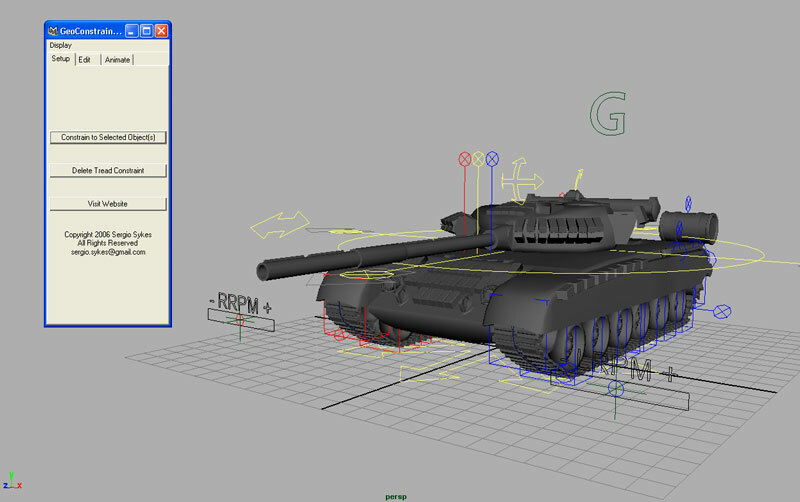 The UI for the tank handles the process of creating, editing, and animating the treads across terrain. For creation, the user simply selects the geometry in the scene that acts as the terrain, and press the “constrain” button. Procedures are then executed that creates an array of geometry-constrained locators that the tread is later point constrained between. Also, a data-structure is inserted in the node of the tank’s controls to keep track of the geometry, the clusters driving the tread and the names of the locators. The constraint can later be deleted completely, or edited in the second tab. Here, the user can add or remove geometry targets to the current constraint system. Once the constraint is complete, the third tab contains sliders for animating how the treads are affected by the terrain. Each piece of geometry is given a collapsible window that contains sliders for animating how much weight the geometry has on a given section of the tread (the tread possesses 32 weight-able sections). In other words, the sliders are connected to the weights of the constraint for each tread cluster. These sliders are keyable and can have expressions as well. This entry was posted in portfolio and tagged maya, MEL, portfolio, scripting. Bookmark the permalink. Hi Sergio, the MEL Script doesn’t exist in that location anymore, is there a new location?